"I just want to stay busy. I don't know how to be idle," he said. 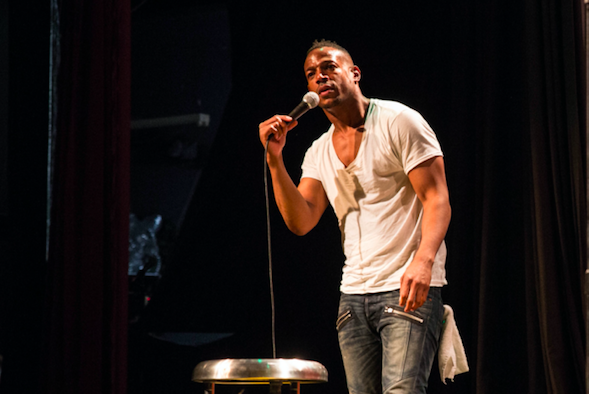 Marlon Wayans' playful pokes at his teenage children caused the capacity crowd at Carolines on Broadway to erupt. Wayans – during a recent gig there – joked about how his son is driving him crazy and how his daughter might be experimenting with a girlfriend. Is rock really dead ... and can the venerable genre co-exist with hip-hop? "My kids are well aware that whatever they say or do might be used by their dad onstage," Wayans said. "They know I'm a crazy man and my job is to look out there and find what's funny." That's the way it is in the Wayans family. Older brothers Keenan Ivory, Damon and Shawn have all used humor to great effect. In many ways, the Wayans brothers are the first family of comedy. The Wayans boys came of age in the Hell's Kitchen section of Manhattan during the 70s, when it wasn't a tony neighborhood with expensive shops. "It was like a war zone when we grew up there," Wayans said. But Keenan Ivory and Damon, who are each more than a decade older than Marlon and Shawn, made it in the world of Hollywood and that opened a door for their brothers. "Shawn and I were thrilled when they had so much success," Wayans said. "They made it and so our belief was that we could make it as well." During the early 90s, Marlon, 45, and Shawn, 47, appeared with their siblings on their acclaimed sketch comedy show "In Living Color." "The Wayans Bros," an overlooked sitcom, featured Marlon and Shawn. The pair hosted the 2000 MTV Video Music Awards and starred in the cult film, "White Chicks," which was released in 2004. "When I'm asked what I do in my spare time, my answer is that I work," Wayans said. "I worked all of those years putting myself on the map and I'm still doing it." When asked how his family is so successful, Wayans laughed. "It's a combination of work ethic, growing up in poverty, and my mother's creativity," Wayans said. "My father made us get up every day very early in the morning to get him coffee. We were poor, so we saw that if you have money, you can get what you need and my mother's creativity was passed on to us. I love to work." Wayans' schedule is typically packed with projects. He starred in the Groundhog Day-esque film "Naked," which hit screens last August. "I worked all of those years putting myself on the map and I'm still doing it." His sitcom vehicle "Marlon" was renewed for a second season by NBC. "My sitcom is an exaggeration of my life," Wayans said. "It's based on real experience. I know what it's like to break up with someone and have to raise two kids with them. I think the message is unique and good. No matter how bad things are for a couple that breaks up, you have to find a way. You have to find a way to smile. It's about finding the glue to stay together. With so many families that are divided, I think we're making a good statement." Wayans, who performed Saturday night at the Borgata in Atlantic City, delivered some material that will be part of his upcoming Netflix special "Wokeish," which will debut in late February. "I was working out some Donald Trump jokes in the south and the people were laughing," Wayans said. "That's a good sign. If those jokes work down there, I can tell them anywhere." When Wayans was asked if he and his brothers would work together once more, he paused for a few seconds. "I hope so," he said. "I would love to work with them again, but we're all doing our own thing. I would like to do that and make a superhero movie. I just want to stay busy. I don't know how to be idle."